Transfer liquids fast and easily with this Manual Operation Kerosene Pump. It siphons out gas and features an easy to use quick-release valve. 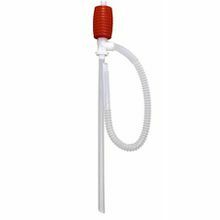 This manual siphon pump is durable and constructed from a non-corrosive plastic material. It comes with a red hand pump to get it started and is ideal for filling lamps, power tools and more.